Zombies have taught us a lot about surviving in the world: Always check the backseat, beware of public restrooms, wear seatbelts and, most importantly, keep up with your cardio. But what can they teach us about content marketing? It turns out, a lot. If you want to thrive in the content marketing world, remember these important truths as revealed by the latest learnings on dealing with zombie hordes. It’s pretty easy to take one zombie out. They don’t move very quickly, and they’re easily distracted. One swift blow with a blunt object usually does the trick. 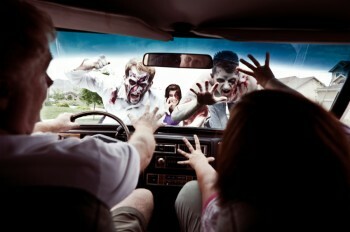 However, zombies in groups are intimidating, harder to fight off, and harder to outrun. The effect is the same with content. If you write just one blog post or tweet, some people may read it, but then it could quickly be forgotten amid the rush of new content that’s created every day. For a much bigger impact, spread your message using multiple channels and link it all together into one unified social media campaign. A blog post that you tweet about, discuss on Facebook, and mention on LinkedIn will reach a much bigger audience. Your message will build on itself, creating a conversation that will cast a wider net than just a single post. Here are 12 things to do after you’ve written a blog post. You can’t ever count a zombie out. They’ve already come back from the dead once. And many of them keep coming back over and over again. Content acts the same way. Just because you’ve published something once doesn’t mean you can’t ever use it again. Information can be repurposed in different ways. A sales presentation or blog post can be transformed into an interesting webinar or article. Maybe content from your website could be expanded to produce a white paper? Don’t forget to utilize multiple formats such as a how-to article could provide excellent content for a YouTube video. You can even repeat topics. Not everybody saw it the first time, so don’t be afraid to revisit something, especially if it could use an update or has suddenly become timely again. Here are 23 ideas on how you can repurpose a blog post. They are always out there, wandering around, lurking in public bathrooms, or staggering about on your lawn. You have to try hard to get away from them. The same holds true for content. It’s out there working for you all day and all night; it never takes a break and it’s everywhere. One of the best things about the Internet is that it provides access to information anytime we need it. If you are putting content out there, your audience will be able to find it 24/7. And you can update it as needed in real time, responding quickly to current events and new developments in your industry. They may be frightening, they may be disgusting, but they will certainly hold your attention. Shouldn’t the same be true for your content? Good information should either surprise you, make you laugh, startle you, educate or entertain you. It should grab you when you least expect it and pull you into something interesting or new. An online audience will come back again and again if they know they’ll find content that delivers useful information in a compelling, authentic, and intriguing way. And if it’s not interesting, we all know what to do — double tap. Ann Meany is managing editor at Brandpoint, a content-based marketing solutions company that helps build exposure, credibility and awareness for brands. Ann has more than a decade of experience in digital media and marketing and leads a talented team of multi-channel content creators who produce engaging, relevant content for Brandpoint’s clients. You can follow Ann on Twitter @annkmeany or join the Brandpoint community @brandcontent and Facebook.